“How Much Refund Per Child?” at M & M Income Tax Service, we start hearing this question as early as November each year. We realize that as the holidays approach, not only are people eagerly awaiting the holiday season, they are also looking forward to “Tax Refund Season” (aka “Tax Money Time”). “Tax Money Time” is the time of year lots of people count on to get caught up on their on their bills after the holidays. So, to answer the question, “How Much Refund Per Child?”, our quick answer would be “It depends.” It depends on how much earned income you had during the year. And it depends on how many children you will be claiming on your tax return. Earned Income Credit is a tax credit for low to moderate income families who work. The EIC credit is calculated based on your families earned income and how many qualifying children you have. Each qualifying child up to 3 increases the amount of the EIC you eligible for. 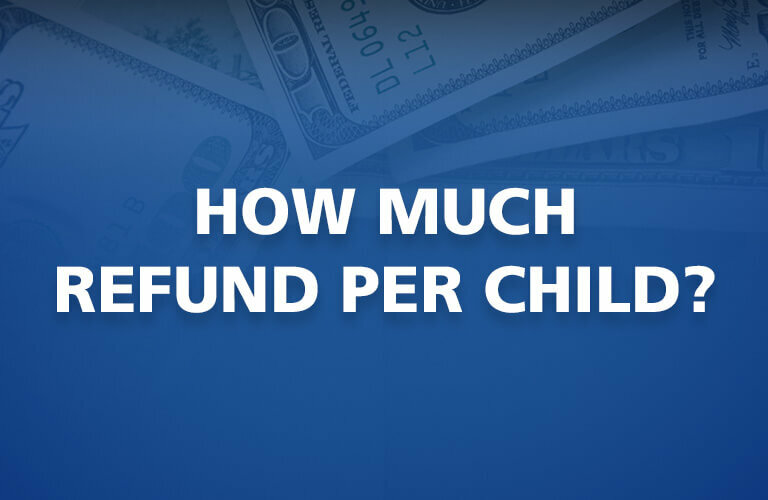 So, you may be asking “How much for one child?” or “How much do you get back per child?” There is no set amount per child, but you can qualify for up to $6,250 total in EIC depending upon your earned income. EIC is refundable, which means that even if you do not pay any taxes in during the year (i.e. zero) and you qualify for EIC, you can still get a big refund. In other words, you can get more back than you paid in. Child Tax Credit is a tax credit for families who have children under the age of 17. Typically, the credit is $1,000 per child under age 17 and the child must reside in the United States. The CTC can be refundable (i.e. Additional Child Tax Credit) as well. Most people who qualify for EIC also qualify for the CTC. Beginning in January, you can get an instant tax refund advance up to $6,000 at M & M Tax Service. Yes that’s right; tax refund loans are available this year! With the IRS announcing they will be holding tax refunds of early tax return filers who have children until February 15th or later, you may need this money now. Many times we see people that count on their early season tax refund check to catch them up on their bills after the holidays. Learn more about our Easy Advance*.